Machined plastics are produced by removing excess material and then drilling holes or creating other specialized features to meet your application requirements. Routing, drilling, or CNC milling equipment is used to create precise part geometries from blocks, sheets, rods, or other standard forms of plastic materials. Plastics machining is fast, cost-effective, and versatile, but are machined plastics right for your application? Let’s take a look at the advantages of machined plastics, and consider how CNC milling, drilling, and routing can be used to machine many different plastic materials. 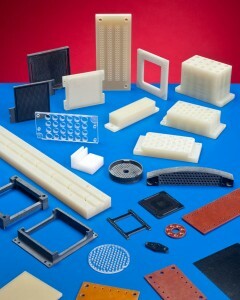 Machined plastics do not require molds. Instead, equipment such as a router reads a computerized file that contains two-dimensional (2D) part coordinates. Applications such as AutoCAD and SolidWorks can output computer-aided design (CAD) files in a variety of formats, including .DXF, .HPL, and .EPS. These files contain highly-precise instructions, and enable part designers and manufacturers to make changes easily. Because machined plastics don’t use molds, there’s never any special tooling to make or revise. Although some initial molds can be made from lower-cost materials, production molds for high-quality plastic parts are often expensive. Moreover, plastics machining supports both quick-turn prototyping and low-volume production. Work can start sooner, and part revisions can be incorporated more quickly. Cost and speed aren’t the only benefits. Plastics machining is more precise than plastics molding, and supports fine trimming or de-gating for a blemish-free finish. At Interstate Specialty Products, for example, part specifications for machined plastics can include holes as small as 0.010” to 0.5” with ±0.002″ tolerance, and internal radii from 0.012. Machined plastics are made of ABS, Acetal, acrylic, Delrin, HDPE, Kapton, Lexan PTFE, PVC, Torlon, Ultem, Vespel and many other polymers, including hard-to-mold plastics. Examples of machined plastics from Interstate Specialty Products include insulators, standoffs, spacers, shims, and flow components. We’ve worked with plastics 0.0002″ to 1.0″ thick, and can meet or exceed MIL-I-45208A specifications. Are machined plastic parts right for your application? For more information, contact us on-line or call (800) 984-1811.